DESCRIPTION: First glance at the title might encourage the reader to think this might be a story of everyday political folk, but it is in fact a carefully researched study of a much neglected area of British history. 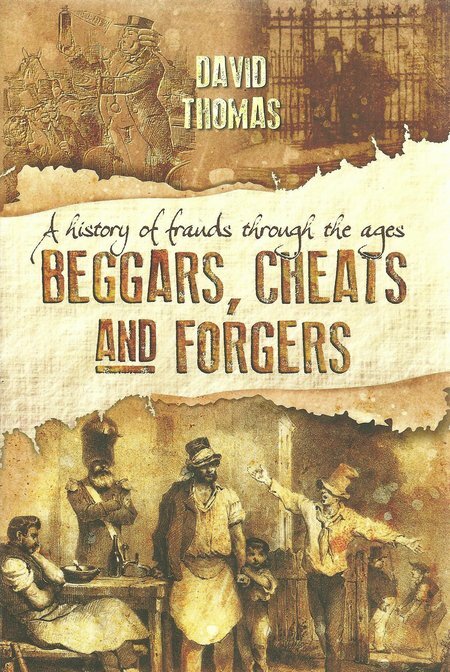 It produces a fascinating view of historical scams and holds the reader’s attention to the end. The author is a former Director of Technology at the National Archives, responsible for implementing the systems that provide communications and digital information internally and onto the Internet. A unique knowledge of what data is available, and how to access it to best purpose, has combined with a long-standing interest in crime, imprisonment and poverty, subjects he has already written about extensively for family history magazines. He provides a fresh view of criminal history and the roots of modern crimes. In reality, threats change little over the generations in their underlying nature. Only the outward detail differs and the ease with which some crimes can be committed because the lazy have failed to consider risk and take measures to reduce it to acceptable levels. The research guide for genealogists and researchers, that is included within the pages, points them towards more unusual archives. This book is therefore not just an entertaining and informative review of a set of subjects that are always of compelling interest to many people, but it is the basis for a work-in-progress that could provide the foundations on which to consider and grade enduring risks and modern threats. There is a very interesting photo plate section and some illustration in single colour embedded in the body of the book. This supports the examples of fraud and forgery that are the basis of what we now refer to as white collar crime. The examples from the past show that crime is never victimless and that many criminals would have achieved more by applying their skills and energies to legitimate endeavours. There are differences between modern crimes and their older roots. In the past, before the electronic age, a criminal could move away from the area of a set of crimes and start again because of weaknesses in communications and policing. Today that is more difficult because global communication does potentially provide the means of tracking a malefactor and apprehension is more assured. Once apprehended, the criminal may be sent to crime college and let out early to relieve prison overcrowding, to go on and commit even greater crimes with greater efficiency. There is also a significant difference in the ability watch for crime. In the past, it was possible to place valuables inside a physically secure container, room, building, or compound, and establish an area of view that made it much more difficult for a criminal to approach unseen. Today, cyberspace provides huge areas of invisibility that exist because few people made any real effort to consider the dangers when electronic systems were first created and applied. Even now, most protective systems sit on top of a largely unknown mass that leaves enormous areas of unappreciated vulnerability.